Styled on a tree from an ancient grove, this lovely Sweet Plum has a beautiful and artistic appearance. With highly defined branch structure and wonderful winding trunk flow, this is a very graceful indoor bonsai tree. 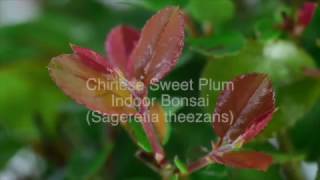 The Sweet Plum (Sageretia theezans) is on of the most lovely indoor bonsai trees for sale. The new leaves are flecked with red and it displays pretty purple fruits as it matures. Free delivery available. Please choose your delivery date at the checkout. Gift wrap & personalisation options are also available below as are some bonsai essentials. This is a fabulous natural grove styled bonsai with an open canopy. It looks stunning in the moss green ceramic pot. This bonsai is highly refined and has been pruned to represent a bonsai one would see in an citrus grove. Great bonsai, with lots of character and ideal for beginners. * Pot details: Moss green rectangular ceramic bonsai pot.